BENGALURU | NEW DELHI: The future of Aadhaar Pay, envisaged as a central plank of the government’s digital payments drive, hangs in the balance. Experts said it will probably now be restricted to rural areas, where most people get welfare payments from the government and have pre-existing Aadhaar-linked bank accounts. The Supreme Court’s scrapping of the mandatory linking of Aadhaar with bank accounts will impact the payment mechanism that allowed customers to use their unique identity to conduct transactions instead of debit cards or other instruments. The judgement said direct benefit transfers will continue to be Aadhaar linked. Customers should still be able to use the system if they choose to do so, a senior private sector bank executive said. “For all practical purposes, Aadhaar has become optional,” he said. Aadhaar-based payments, which are managed by the National Payments Corporation of India, allowed customers to operate bank accounts using the 12-digit ID and biometrics. 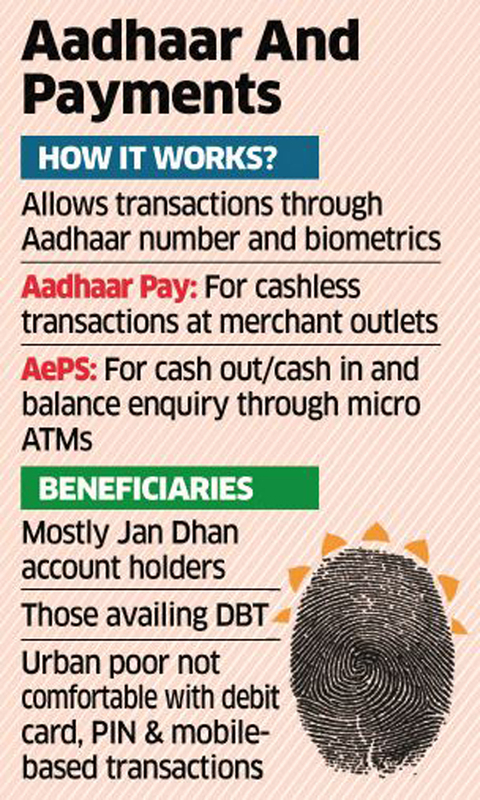 The system has two components —BHIM Aadhaar Pay and Aadhaar enabled Payment System (AePS). (BHIM stands for Bharat Interface for Money, an NPCI app.) BHIM Aadhaar Pay is a merchant app that can be used to receive payments from customers digitally. AePS allows consumers without smartphones or debit cards to withdraw or transfer funds and check account balances using biometric authentication through microATMs. Aadhaar Pay was launched by Prime Minister Narendra Modi in April 2017 as a key element of the government’s financial inclusion and digital payments drive for those without credit and debit cards. Part of its mission was promoting digital payments outside urban centres. While Aadhaar linking is no longer mandatory, the convenience of the identity-based payment system could mean that it may persist in voluntary form, a government official said. NPCI did not respond to ET’s queries. In the year to March, there were 104.2 million AePS transactions for a total value of Rs 26,286 crore, according to NPCI data. The official cited above said that Aadhaar Pay had been more widely adopted in rural areas. Executives said such payment modes help people in remote locations without bank branches and ATMs to avail of basic financial services in a cost-effective manner. Life for such users could get harder without Aadhaar Pay. Regulators and lawmakers should clarify the effect of the judgement on Aadhaar-based payment mechanisms, an analyst said. “In spirit, the judgement supports leveraging Aadhaar for benefits distribution. Non-state banks such as IndusInd Bank, Yes Bank and RBL Bank have been at the forefront of deploying terminals to process Aadhaar-based payments in rural areas and expand their presence without having to invest heavily in bank branches and ATMs. The Prime Minister had said at the time of its launch that the BHIM Aadhaar Pay app can work even on a Rs 1,000-1,500 phone. Almost 970 million bank accounts held by 610 million people have already been linked to Aadhaar and so have more than 800 million mobile phones subscribers. It’s Not Reliance Jio; Now Meet Baba Ramdev’s Patanjali Sim, Which Offers You The Cheapest Annual Plan.